I do not like how apps are displayed on Google Play for the same reason I do not like Chrome's web store: there is no option to sort by date, which means that it is really difficult to find new apps and games in the store. While a top new apps or games listing is displayed, it consists only of a selection of games that have already been in store for some time. 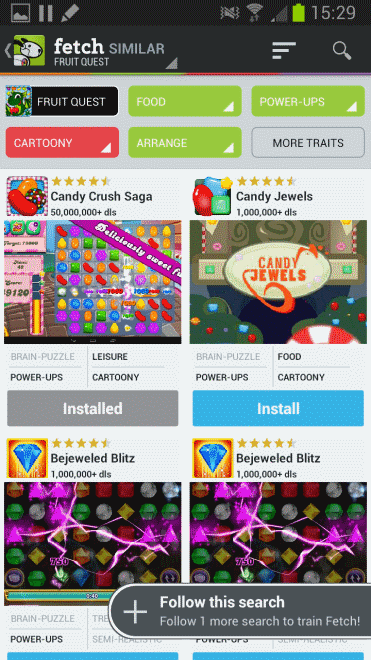 That leaves apps that provide you with information about new and interesting games or applications for Android. Update: Fetch is no longer available and I could not find an alternative, unfortunately. Fetch is one of those, basing its recommendations on the things that you like. You can either select a game or app that you like and get similar recommendations based on it, or use the search to find new apps or games based on that. To find similar apps, tap on the fetch menu at the top and pick the similar option from the menu. All your apps and games installed on the device are listed here, and all you need to do is pick on to get similar recommendations based on it. 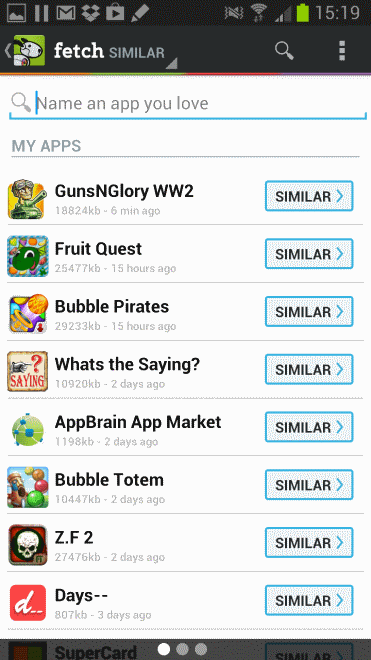 A list of related apps or games are displayed to you after you make the selection. Each application is displayed with its name, screenshot, the number of downloads and the categories it has been sorted in to. A category filter is displayed for games that you can make use of to add or remove traits which has a direct impact on the search results. This filter is currently only available for games, but the developers promise that it will be added to apps searches as well in the near future. You can click on install to be taken directly to Google Play from where the selected program can be installed to the device. You can follow searches so that new additions are automatically displayed to you on the apps' home screen. Here you find a selection of new apps and games that match your preferences. The selection is not always made up of new games or apps though, you also find established applications listed here. To search, select the search icon at the top or tap on games or apps on the screen instead. The search uses keywords including names of apps, genres, or certain characteristics such as cartoony. You can combine these keywords, for instance to find tower defense war games, or wallpaper apps, or virtual pets. What I like most about Fetch is that you can customize the feed of new apps or games that are presented to you by it regularly. While you may miss out on some that do not match your preferences, you can be certain that you won't miss any great new ones matching them that are released to store. This has really opened up possibilities. The Google Store should be organised like this, only better. In a world with so much dross, it’s really useful to be able to filter and sort. It amazes me that so many obviously talented coders see the need to create endless Tetris / Sokoban / Rush Hour / Colour Match clones. We need less copying and more originality, but there is no filter for that!